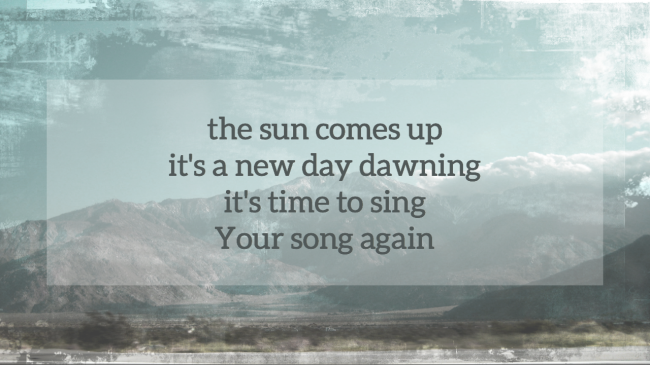 Moving images behind the words on worship songs – a help or a hindrance? We had this fascinating question from John Spencer which we thought we’d throw open for comments. “My wife and I have been attending a local Pentecostal church and they use Powerpoint projection of the words of the worship songs. But they also project moving images behind the words – such things as crosses silhouetted against moving dark clouds, planets and exploding stars, rivers, waterfalls, people out of focus with their hands in the air, etc. Personally my wife and I find such moving images a distraction from the worship and feel that they are quite unnecessary. E.g. When we sing the William Booth hymn “Send the Fire”, we don’t need to see flames from a gas fire in the background while we sing the stirring words! To answer John’s question, yes it is a bit of a new trend. We’d be really interested to know what other people think – do you find it helpful or a hindrance? My church uses one image of a boat on water which makes me feel quite seasick but sometimes I find pictures quite nice to help meditate on. It can be good to engage some other senses beyond singing. Do comment in the box below. If only they were all as tasteful! This entry was posted in Ask the expert, Visual worship & creativity and tagged media shout, ohp, worship backgrounds, worship graphics, worship ohp, worship projection. Bookmark the permalink. Trackbacks are closed, but you can post a comment.